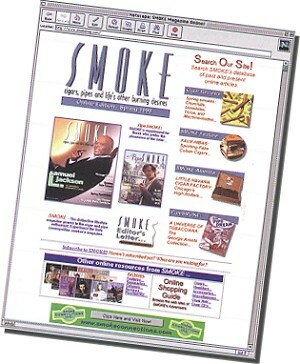 Although Smoke's popular web site has been up and running since the magazines introductory issue in December of 1995, banner advertising capabilities have just been added as of March, 1 1998. Chris O'Hara, vice president of Lockwood Publications, who heads up its Internet activities, began the program to address the rising cost of maintaining the site, and because of heavy demand from advertisers. "It's not enough for suppliers to the industry to rely on space advertising and point-of-purchase materials anymore - especially for the new cigar and accessory manufacturers," O'Hara notes. Pointing out the reluctance of many retailers to accept new products, O'Hara adds, "the secondary market is becoming a real boon to these new players, offering them the opportunity to get some low-cost but valuable exposure to customers they wouldn't otherwise encounter." In just one month, the Smoke Online site sold out its banner inventory to approximately 15 advertisers, all of whom have been impressed with the results. Famous Cigars of New York was particularly impressed with initial results from the site, with Internet-based sales for the company increasing dramatically after the banner was installed, according to company owner Arthur Zaretsky. Sales on the site are based on "impressions," or the number of times the banner is shown to a viewer. The minimum purchase of 20,000 impressions offers advertisers approximately one month of exposure on the site. Depending on the uniqueness of the banner ad, customers can expect a 5 percent "click-through" rate (or times a viewer enters the advertiser's site through the Smoke-based banner ad). One feature of the site which appeals to many advertisers is the ability to track ad response on a daily basis. Each banner advertiser receives a coded account number, with which they can receive statistics on their banner ad including: number of impressions purchased, the date the banner appeared on the site, and the number of click-throughs received on the site. Updated daily, the information helps advertisers track response to their ad and gauge its effectiveness. "This is really what sets it apart from print advertising," states Bob Curtis, Smoke's webmaster and creator of the site. "Unlike a print ad, Internet advertising gives immediate results. A site like Smoke's attracts highly qualified cigar customers who come to the site because it has the most cigar-related information, editorial, and links of any cigar site. The more this core group encounters a company's banner, the more likely it is that he will base his next purchase on it when he gets to the cigar store." Internet ads augment the traditional display advertising effect; continually exposing the consumer to the company's brand. Does the site pose a threat to cigar sales for the traditional cigar store? "Not even close," explains O'Hara. "The fact remains that more than 80 percent of all cigar products will be sold by the traditional retailer, and nothing can replace a qualified tobacconist when it comes to giving the smoker valuable advice and knowledge. Internet advertising merely supports brands and products that are sold in stores. It also gives retailers the ability to obtain information about new products to consider." Additionally, Internet-based advertising and content drive interest and sales in all cigar products across the category, enlarging the retailer's 80 percent stake.